Nanoscale simulations and theoretical research performed at the Department of Energy's Oak Ridge National Laboratory are bringing scientists closer to realizing graphene's potential in electronic applications. A research team led by ORNL's Bobby Sumpter, Vincent Meunier and Eduardo Cruz-Silva has discovered how loops develop in graphene, an electrically conductive high-strength low-weight material that resembles an atomic-scale honeycomb. "Graphene is a rising star in the materials world, given its potential for use in precise electronic components like transistors or other semiconductors," said Bobby Sumpter, a staff scientist at ORNL. Imaging with a transmission electron microscope, or TEM, subjected the graphene to electron irradiation, which ultimately prevented loop formation. The ORNL simulations showed that by injecting electrons to collect an image, the electrons were simultaneously changing the material's structure. The research builds on findings discussed in a 2009 Science paper (Jia et al. ), where Meunier and Sumpter helped demonstrate a process that cleans graphene edges by running a current through the material in a process known as Joule heating. 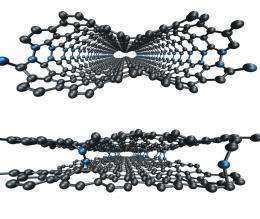 Graphene is only as good as the uniformity or cleanliness of its edges, which determine how effectively the material can transmit electrons. Meunier said the ability to efficiently clean graphene edges is crucial to using the material in electronics. "Imagine you have a fancy sports car, but then you realize it has square wheels. What good is it? That's like having jagged edges on graphene," Meunier said. Recent experimental studies have shown that the Joule heating process can lead to undesirable loops that connect different graphene layers. The PRL paper provides an atomistic understanding of how electron irradiation from a transmission electron microscope affects the graphene cleaning process by preventing loop formation. "We can clean the edges, and not only that, we're able to understand why we can clean them," Meunier said. Ever is uneven any graphasting but never was not even one graphastest unever, bey quadrate. Mean, all graphastes are always without theory because with practum is also not the real graphaste.